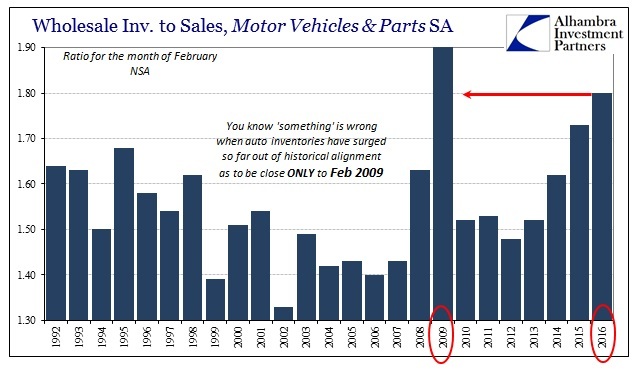 Contra Corner » Will Autos Be The Recession Trigger? Will Autos Be The Recession Trigger? 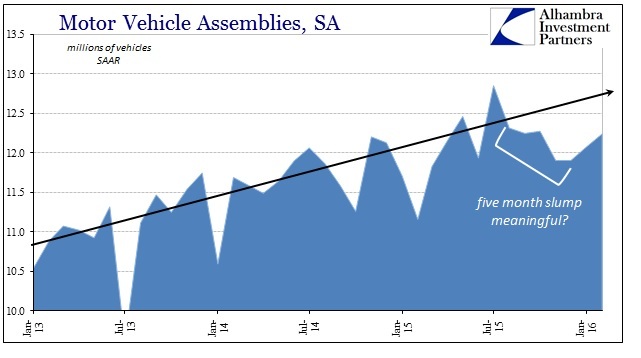 What is most amazing about the current “manufacturing recession” is that it has occurred while automobile production has remained rather stout. That would suggest the state of production beyond motor vehicles is much worse than the headline contraction rates. However, that might all be changing as we know “something” is amiss in the auto segment. 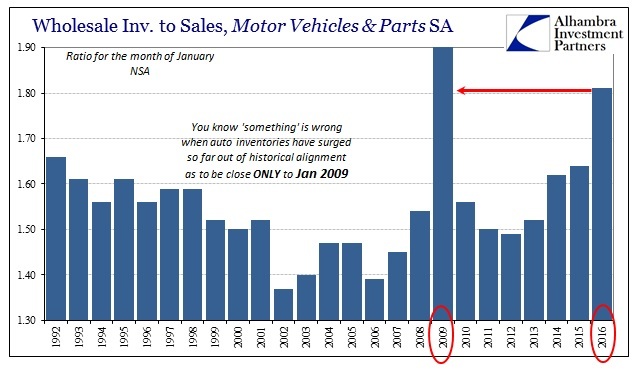 Inventories of all kinds of vehicles have piled up especially on the wholesale level, leaving channels stuffed to a degree not seen since the worst of the Great Recession. As inventories rose, auto production stumbled on both the domestic and import side. 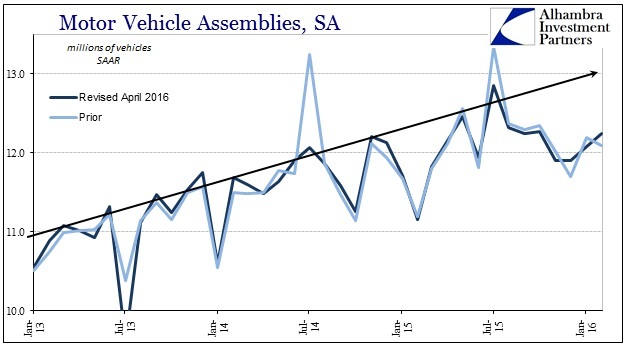 US production, or the Fed’s data series within Industrial Production counting motor vehicle assemblies, showed a sustained drop that began around August. That is, of course, likely not coincidence given that it is coincident to the “global turmoil” policymakers have referred to of late as a benign pretext in substitute for the previously benign “transitory.” Assemblies rebounded somewhat in February, but inventory remains downright repulsive and even that upturn in production may be nothing more than the usual monthly variation. Benchmark revisions in the data released this month have taken some of that volatility out, but it still leaves questions about where auto production is heading not just on its own terms but relative to the overall engrossing slowdown and manufacturing recession. The problem is not just the disparity suggested by inventory, as the inventory surge these past few months is itself being driven by an actual and serious setback in overall motor vehicle sales. 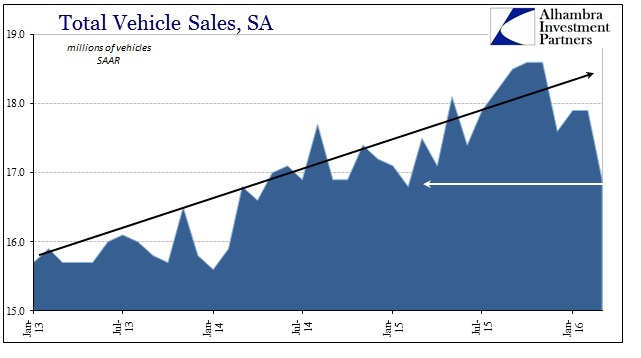 In other words, it seems something altogether different than a more benign scenario where car and vehicle manufacturers have had to slow production temporarily in order for sales to catch up; vehicle sales are actually tanking. Sales have been quite robust as, again, autos have been about the only bright spot in this recovery and especially during the slowdown portion of it. Peaking in October and November at 18.6 million units SAAR, the level of sales has dropped by an astounding 9% to just 16.9 million in March – with sales falling 1 million SAAR in March alone. It certainly would seem to confirm the channel stuffing at the wholesale level (it should be pointed out that a good portion of the decline is due to reduced sales and demand for commercial fleets especially in the transportation sector). With auto sales being driven at the margins by leasing and subprime financing (included in those leases), it is not surprising to find suggestions of a financial component to the auto retreat. Taking the Federal Reserve’s estimates for monthly flow of non-revolving consumer credit minus government additions to that flow reveals exactly the same pattern as seen in the data above. Though this adjustment admittedly conflates more than just auto loans since non-revolving credit includes other expressions of consumer credit, the calculation provides a reasonable proxy for potential financial conditions very much related in good part to the auto sector. 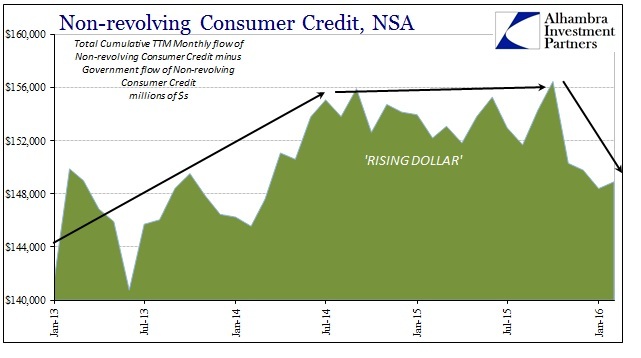 On a trailing-twelve-month basis, non-government non-revolving consumer credit flow has clearly dropped off after stagnating somewhat coincident to the onset of the “rising dollar.” The decline is not enormous or even perhaps alarming except that it suggests one reason for first softening sales that have turned since last summer to something potentially more significant than “softening.” The peak credit level in my calculation above was also October, matching exactly the peak in motor vehicle sales. There has been a tendency at times to qualify the “rising dollar” issue as some kind accounting matter, as if it were just numbers changing on everyone’s spreadsheets absent any real world implications. We can’t know for sure whether this potential shift in borrowing is due to demand for funding and credit (or cars, specifically) or whether it is the initial symptoms of a credit crunch and thus bank and finance-offered supply of debt. And there are many other factors to consider as well, including that these various data points do not strictly adhere to each other, conflating and including other parts of each data series. All that in mind, however, the fact that there is a high degree of agreement among these accounts suggests that there is likely something to it all and the “dollar” playing some role in it (either directly as reduced credit or indirectly economically as reduced demand for it). 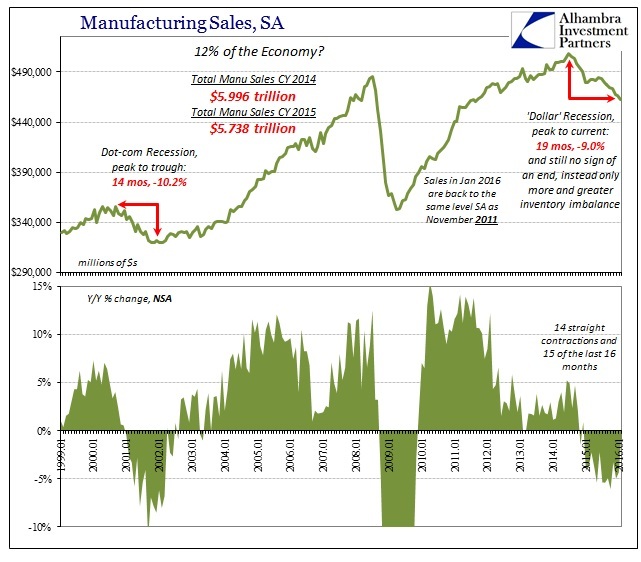 If that is the case, it might propose that the “manufacturing recession” which to this point has been outside of autos might be set for an unfortunate augmentation – pushing the whole economy out of just slowdown and into the dreaded cyclical.